Why was one servant so violently abused? 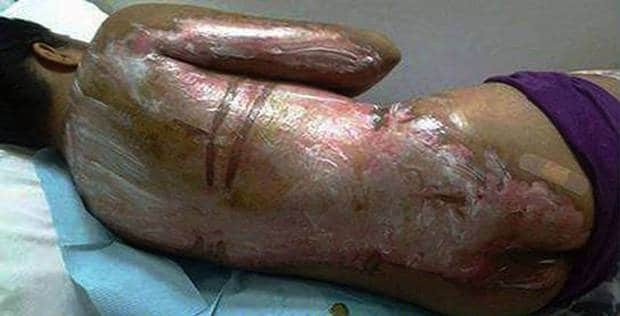 Havoc has been caused amongst servants in the city of Riyadh, Saudi Arabia after a Filipino maid was left inundated with burns after her Saudi boss’s mother allegedly threw boiling water as punishment for not making coffee quick enough. Despite incurring deep scars to her back and legs, the 23 year old maid was not taken to hospital for hours. Upon arriving at hospital the Filipino maid passed her cousin’s telephone number to hospital staff, urging them to call for help. Outraged, her cousin has shared images of ‘Fatma’, which is not her real name, on Facebook. The cousin would also add how his cousin had during other occasions been beaten and deprived of food. Told the post: ‘This is my cousin, who works as domestic helper in Riyadh, Saudi Arabia. ‘Her female Saudi employer poured boiling water on her. She has only been in Riyadh for two months. ‘She was only taken to the hospital six hours after boiling water was poured on her. The country’s Department for Social Welfare and Development is providing Fatma with medical care and accommodation. This is not the first time a foreign maid employed in Saudi Arabia claims of being abused by her employer. The governments of Saudi Arabia and the Philippines signed an agreement, last May, that gives Filipino workers more rights in the Gulf kingdom. Which poses the question why the hostility and second class treatment? That biotch needs to be dunked in some of hot coffee herself as punishment .